When we talk about Vitamin-C, the first thing that comes to our mind is “Immunity”. Immunity against viruses are essential for everyone but more so for children. Living in a city like Bangalore where the temperature fluctuates a lot, children fall sick more often. Since the immunity of toddlers and pre-schoolers is building up, the frequency of catching a cold/cough is high. You don’t need a health drink like Pediasure or a multi-vitamin “gummy bear” to boost their immunity. And no “fortified” packaged orange juices too. All they need is good sources of Vitamin-C in their diet. Vitamin-C is a water soluble vitamin and aids in the absorption of iron. It is not produced or stored in the body and so it has to be acquired through food. Vitamin C boosts immunity and is necessary for the production of collagen, a protein for maintaining the health of the skin. Vitamin-C also has anti-oxidant properties. It also helps in the formation of neuro-transmitters, thereby helping certain cases of mild depression. Though Vitamin-C has numerous benefits, consumption in high doses through pills/supplements can be dangerous. It is always better to rely on natural sources like fruits, vegetables and greens. Recommended intake of Vitamin-C is 40 mg/day (for children and adults). 2) Though “orange” has been glorified as the best source of Vitamin-C, local fruits such as gooseberries (amla/nellikkai) and guavas have 4-5X Vitamin-C as compared to oranges. Let’s give more preference to the humble guavas from the cart-vendor than the imported oranges that come with a sticker. 3) Make it a habit to include "amla candy" in your children's diet. Easily available in many stores, kids usually like them since it is made with honey. Amla can also be easily turned into a juice, pickle or a curd pachadi. 4) As I keep reiterating, green leafy vegetables are nature’s gift to us that are rich in various vitamins and minerals. To increase Vitamin-C intake, let’s include greens such as drumstick greens, ponnanganni, amaranth and agathi on a regular basis. Parsley is also an excellent source of Vitamin-C and it grows easily in a small garden space. 5) Bell-peppers / Capsicum are 3X times rich in Vitamin-C than oranges. The colored ones make any dish look so attractive that kids usually love them. Make them into a stir-fry, pulao/fried rice, salad or just plain sticks to munch on. 6) Summer is the season of mangoes. Apart from beta-carotene, mangoes are a good source of Vitamin-C too, especially the raw green ones. Raw mangoes can be easily incorporated in salads or gravies - from maanga pachadi in the South to kache aam ki kadhi in the North, there are plenty of recipes. Update: After publishing this post, a thought occurred :-) How did I miss the famous imported New Zealand "Kiwi" fruit that's adorning EVERY supermarket shelf in Bangalore these days? I couldn't get its nutrition information from Indian Food Composition Tables (duh! it's not an Indian food produce for God's sake)......and so I googled. Turns out Kiwi fruit has 92 mg of Vitamin C /100 gms. 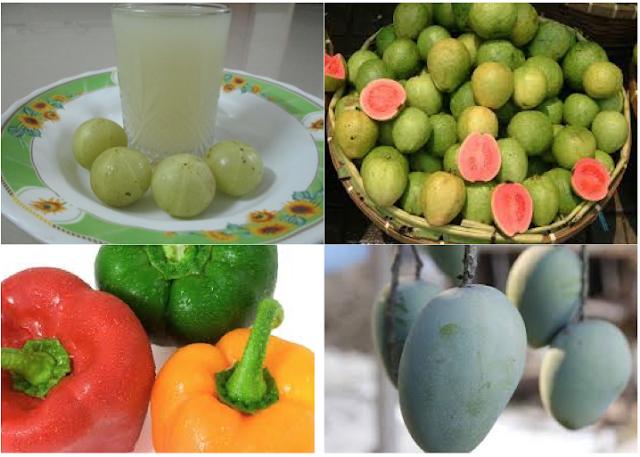 Compare that to our local amla and guavas, friends! Do we really need to spend 40 bucks on a single Kiwi fruit to get our dose of Vitamin C? Aren't there better pocket-friendly and eco-friendly choices with less carbon footprint? Anything advertised has to be questioned - I have seen a huge billboard in Bangalore promoting kiwi fruit that depicts how you can just cut and scoop it with a spoon. Will it match the same taste as that of a fresh, juicy bite of a guava? Something to think about. Do you find these posts on Vitamins and Minerals helpful? Are there any other topics that you'd like me to write about? Let me know in the comments below.